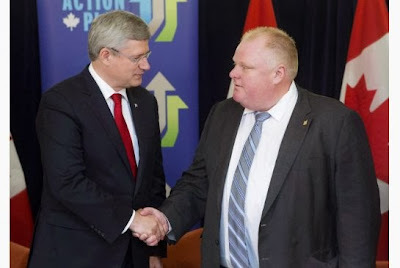 Buckdog: "Conspiracy against Rob Ford and Stephen Harper exposed"!!!! "Conspiracy against Rob Ford and Stephen Harper exposed"!!!! Yes, Rob Ford did smoke crack cocaine. So what? He says he'll stay on as Toronto's mayor. It's Bill Blair, the police chief investigating Ford who should resign. Ditto in Ottawa. It's not Stephen Harper's fault that he appointed to the Senate three people he now calls grifters. It's not his fault that his most trusted aide wrote one of those senators, Mike Duffy, a cheque for $90,000 in exchange for unspecified services. Nor is it the prime minister's fault that the party he heads paid $13,000 to cover the legal fees Duffy incurred in hammering out the $90,000 deal. Nope. It's the fault of the courts for stymieing Harper's Senate reform plans. Clearly, there is a conspiracy afoot to discredit conservative politicians. The courts are in on it. Harper nailed them in his speech to Conservative delegates last week. So are the Ottawa elites that the prime minister insists he doesn't belong to. Chief Blair? We've got his number. Rob Ford's brother, Doug, blew the whistle on him Tuesday morning. Blair's the most political police chief in the history of the world, said Doug, and should step aside. That's because the chief said he was disappointed to find that the mayor of Canada's largest city had been caught on video smoking crack. Do you need any more proof of the conspiracy? The conspiracy has been aboil for some time. International in scope, it is directed at right-thinking politicians who are simply trying to defend liberty and save the taxpayers their hard-earned money. In the U.S., the conspiracy has taken the form of Obamacare. When Sarah Palin pointed out that the aim of Obamacare was to set up death panels, the elites mocked her. But anyone who knows anything knows Palin was right. Anyway, Obama is a Kenyan-born Muslim and probably a terrorist too. Thank goodness that we in Canada have Harper. He figured out early on that the entire climate change debate was a scare tactic employed by anti-growth zealots who want to subvert the market. His energy minister, Joe Oliver, identified the cabal of foreign socialist billionaires who want to derail not only the Conservative government's pipeline plans but the entire Canadian economy. Billionaires like financier George Soros. Soros is central to pretty much every conspiracy. Harper doesn't go to those fancy parties in Ottawa put on by the elites. His idea of a good time is dinner at Arby's in Kanata. In fact, that's probably where he ran into Pam Wallin, Mike Duffy and Patrick Brazeau back in 2008. That's probably where he said to himself over a bacon beef ‘n cheddar: Hey, these three would make great senators. How was Harper to know that Duffy didn't live in Prince Edward Island, the province he is supposed to represent in the Senate? How was he to know that Wallin has a passion for limousine travel? Harper's problem is that he is too trusting. He's a laid-back '60s kind of guy who lets his ministers and MPs do whatever they please. He's no match for the sly elites. Nigel Wright is part of the elite. Probably, he's a secret ally of the union bosses. But Harper, in his usual trusting way, hired Wright to run the prime minister's office and then gave him his head. How was Harper to know that Wright would single-handedly mastermind a scheme to pay Duffy's questionable expenses? How was he to know that Sen. Irving Gerstein, the Conservative Party's chief bagman, would cut a $13,000 cheque to pay Duffy's lawyers. Nobody ever tells Harper what's going on. The Ottawa elites were probably cooking up this scheme in one of the fancy Quebec bistros they frequent. Down at Arby's, no one knew anything. In his new book on the history of hockey, Harper details how Toronto's early 20th century elites (which, tellingly, included the Toronto Star) attempted to prevent Canadian hockey from going pro. Even then the conspiracy against market forces was in full swing. In the end, the elites weren't able to stop hockey players from becoming millionaires. We shall see whether they are able to sideline those sterling champions of good government, Rob Ford and Stephen Harper. This was no doubt written by a Freemason.